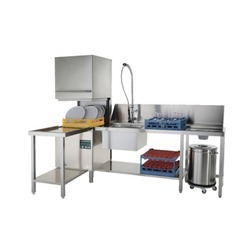 We are a leading Importer of electrolux hood type dishwasher, under counter dishwasher, hood type dishwasher, ifb rack conveyor dishwasher, countertop dishwasher and hoodtype dishwasher from New Delhi, India. ETL-Sanitation approved (ANSI/NSF 3 sanitation standard) and DIN 10512 compliant. 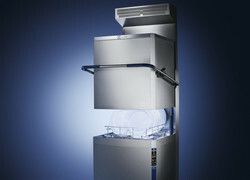 Built-in atmospheric boiler sized to raise incoming cold water to a minimum of 84 °C for sanitizing rinse. No external boiler is required. Constant temperature of 84 °C throughout the rinsing cycle regardless of the network''s water pressure. Maximum capacity per hour of 80 racks or 1.440 dishes (High productivity mode) easy to switch to 63 racks or 1.134 dishes (ETL-Sanitation mode) by pressing a button. 45/84/150 seconds cycles (High productivity mode); 57/84/150 seconds cycles (ETL-Sanitation mode). 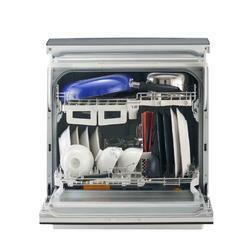 Warewashing Green & Clean Undercounter Dishwasher with Wash Safe Control, drain pump & detergent dispenser. 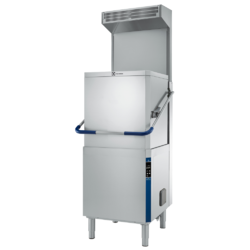 Constant temperature of 84 °C thoughout the rinsing cycle regardless of the network's water pressure and temperature. ETL- Sanitation approved and compliant with NSF sanitization standards. 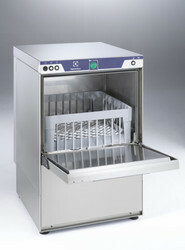 We are offering Hood Dishwasher to our clients. 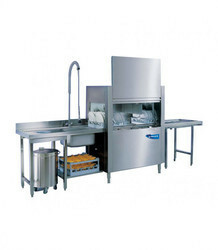 IFB RC 150 (Rack Conveyor Dishwasher)This compact multi-speed conveyor can wash up to 100 baskets/hour and is the ideal solution for small/medium sized operations.